The Robber, or Smuggler as we’ll call it from here on, get’s placed as normal either by rolling a 7 or playing the soldier card. Rather than placing the Smuggler on top of the number, place it to the side of the number. The Smuggler takes one card from one of the players that is built on that resource as normal, but the Smuggler does not block the number. Instead, when that number is rolled, the players built there continue to get the resource, but the player who placed the Smuggler gets that resource as well! This rule variation removes the anger and frustration that would occur when the robber was placed on your numbers. It’s great for playing with a spouse, or a group that is sensitive to tough competition. This game is all about maximizing your probability for success. It’s good to generally spread out the numbers you build on as this will give you a more steady flow of resources. Also, even though theoretically sixes and eights roll more often, in practice you will find the other numbers sometimes rolling very often as well. So you don’t have to worry about building on an 11, for example. Also, try to aim for some sort of engine. For example, if a few good wheat spots and a wheat port are near each other, this could result in a cheap way to trade for the resources you need. You should also build on resources that can be combined to purchase something good. For example, having wheat, ore and sheep for development cards and cities, or brick and wood for road building. If you have plenty of ore and brick but nothing else, then you’d find it difficult to obtain the resources you need. I feel bad posting this one, as there are handfuls of good alternate rules suggestions for the robber here. But I was particularly inspired by the one posted by @cody.raak several months ago, and it instantly became the only way we’ll use the robber. I have added one pretty significant tweak that is worth a shot for anybody experimenting with ways to make the robber less confrontational but keeping it disruptive. @cody.raak suggests turning the robber into the “philanthropist” and allowing the player who rolled the 7 to pick placement for the robber in order to dole out one of that good to all players. This helps a lot with getting over non-producing goods hurdles. But I like to change it’s effect on hand-size penalty as well. Under normal robber rules, anybody with 7 or more cards must discard half of them. What we do instead is “redistribute” cards on a role of 7 BEFORE selecting the philanthropist’s new location and distributing that good. All cards in all player’s hands are counted, and that count is divided by the number of players. They must now be re-allocated as evenly as possible among players. An example: if (in a 3-player game) the players have 7, 5 and 3 cards, the player with 7 cards has to choose 2 to discard… but they go to the player with 3 cards instead of the supply. This keeps encouraging players to spend their cards rather than hoarding them, but also keeps goods plentiful. In the event of non-even division, the player who rolled the 7 gets the extra card. If there is another card to give (i.e., the remainder on division is 2/3), the player with the lowest visible victory points gets the 2nd extra card. Example: if three players had 7, 5 and 5 cards respectively, the player with 7 cards would need to pick 2 cards to discard; one would go to the player who rolled the 7, while the other goes to the player with the lowest visible victory points. If the player with 7 cards is either one of these players, he/she would get one of the two cards back. All picking of these “redistributed” cards is done blindly in order from the player with the fewest cards to the player with the most. Once redistribution is done, the roller of the 7 chooses the philanthropist’s new home and one of that site’s native good is claimed by each player. 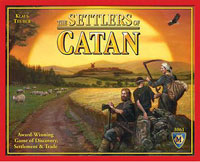 Settlers of Catan has long been one of the standard bearers for “gateway games”, to help get people into boardgaming (many on this site were introduced to the hobby through this game). This (well earned) success has Settlers of Catan on most people’s list of games to recommend to friends to help turn them into gamers. This is all great, as long as you’re willing to help them with their first game. Settlers of Catan isn’t difficult to play, especially for experienced gamers, but we often forget that people completely new to this style of boardgames have never played anything like it, or more specifically, have never learned anything like it. This game is not difficult to learn from someone who knows it, but handing the rulebook to someone and expecting them to learn, and enjoy, the game can be a tough task. There are a lot of little rules over many pages (compare this to games with rules on the box top), multiple mechanics, trading with people, trading with the game, stealing, Development Card play rules, ports, cities, hexes that give resources, hexes that don’t give resources (desert), hexes that are mainly decoration (water), and even board setup to consider. If you haven’t read the rulebook in a while, take a look and think about how it looks if you’d never played this type of game before. I highly encourage Settlers of Catan to continue being used to hook new gamers, but when doing so, make sure someone is there to teach that first game. If you need to steer someone to a gateway game and they’ll be learning and playing it by themselves, take something more straightforward, like Ticket to Ride where the rules are easier to pick up for a first time gamer. During the placement phase of Catan, sometimes you can tell that you’re just not going to get a good spot for resources. Be sure to keep an eye on the ports, because you can make up for lack of resources with good trades with the bank. Here’s an example. You’re starting player and you got a one good spot, but by the time it comes to place your last settlement, you’re not going to get good spot. The resource you’re wanting either has a 2 or 12 on it, or you just can’t get access. This is when you see if there is a port available with 2:1 of a resource you do have access to with good probability or settle for a 3:1 port with a duplicate resource. When playing with three or less players (though I prefer no less than three): ignore the first two settlements when tallying victory points. This slight change will allow for a few more turns and a bit more expansion. It should be a closer game, as the longest road and largest army could potentially change hands more often, more opportunity to draw VP development cards, etc. A dragon has devoured the robber and now roams the land of Catan! Soldier card: The soldier card can be used only to attack the Dragon, and cannot be used to move the Dragon. There is no robber in this variant. Dragon’s slumber: Until the first city is built, the Dragon will sleep peacefully in its Lair. So all 7’s are re-rolled. After the first city is built, all 7’s rolled will cause the Dragon to roam Catan in search of resources. When a 7 is rolled during the resource roll, the Dragon will move. First determine the direction the Dragon moves: Each side of the tile the dragon is currently on will represent a number, starting with one side (chosen by the player who rolled the 7) representing #1, then clockwise the sides of the tile will be #2, #3, #4, #5 and #6. Roll for the direction: The current player then rolls 1 dice, the number rolled will match one of the sides, this is the direction the dragon will move. Second, determine how many spaces the Dragon will move: Roll 1 dice, the number rolled is how many spaces the dragon will move, in a straight line, in the previously determined direction. Move the dragon: Move the dragon in a straight line for both the direction and number of spaces previously determined. If the dragon is on, or moves to, an edge tile (next to water) and would move into the water, it stops on the tile next to the water. When the dragon ends its movement, it will take one random resource card from every settlement and city built on that tile (If one player has multiple settlements or cities built on the tile, they must give up one random card per settlement or city). Those resource cards are put to the side in a pile called the “Dragon’s treasure pile.” The dragon then blocks the resource that it is currently on, but every time that number is rolled, one card of that resource will be added to the Dragon’s treasure pile. The dragon can be attacked either at the beginning of a player’s turn who has a settlement or city built on the tile the dragon is on, or by playing the soldier card. Before the resource roll, the the player may choose to attack the dragon by rolling 1 dice per settlement and city they have built on that tile. Do not combine the total if rolling multiple dice. On a roll of 1-4, the attack is unsuccessful, and the player continues with his/her turn as normal. If that player has a soldier card they may choose to play it before or after the resource roll. If the attack roll is a 5 or 6 on at least one of the rolled dice, the Dragon retreats to its lair (place the Dragon on the desert tile), and the attacking player puts the Dragon’s Treasure cards in their hand. The player will then roll for resources. If a seven is rolled, the dragon will move, but that player ignores the max number of cards in their hand rule for that turn. The soldier can be played as normal on any player’s turn before or after the resource roll. When the soldier card is played, the player rolls 1 dice to attack the Dragon. On a roll of 1-4, the attack is unsuccessful, and the player must put one random card from their hand on the Dragon’s treasure pile, and continues their turn as normal. On a roll of 5 or 6 the attack is a success and the Dragon retreats to its lair (place the dragon on the desert tile). The player puts the Dragon’s treasure pile in their hand, and each player built on the tile the dragon retreated from gives the player who defeated the Dragon one card of their choice for every settlement or city they have built on that tile. Play then continues as normal. I was at a game store and the owner told me this variant… it was awhile ago, so a lot of it is my own take on it. Hope you enjoy! If you can get set up by a port (lumber for example) then settle all you can around the lumber tiles. This will allow you to corner the market on a specific resource and be able to trade your surplus at the sweet 2:1 price. This strategy will work with any resource. Identify what you want to use for the strategy. This should be a popular resource and one there will be a lot of. Wood, Sheep, and Grain I find to be easist. Step 2: When placing settlement place near or on that 2:1 port. You can place near and then build there if you want. I would place your other settlement on the hex corresponding to the port. Step 3: When on your turn if any player has a surplus of that resource, offer to trade it at your port for a nominal fee (say one of that resource). When done right not only do you get extra resources you can trade in easily, but your fellow players get a 3:1 port, and you make friends and profits. This mercantile strategy is time tested in real life trading and in the game world. Try it next time you have a Catanning party. A pretty useful house rule we use to keep the game flowing- if every player has rolled a 7, and then subsequently rolls a 7 AGAIN, a re-roll is allowed. This came about after all 4 of us rolled a 7, and then player 1 rolled a 7 AGAIN, as did players 2 and 3, until we decided if player 4 rolled a 7, it would need to be re-rolled. A small change, that doesn’t come in too often, but can be useful for speeding things up in 7 heavy games. Try to have initial access to all 5 resources — even if one or two of the resources are on less than frequent numbers. If not in initial placement, plan so that you can be active on all 5 resources with your first placed village. This allows you to not HAVE to rely on trading to gain resources. Furthermore, there are plenty of games when the “less frequent” numbers (3,4,10,11) are rolled a lot. I’ve seen many good players get caught up competing for specific goals, only to lose because while they were trying to build the larger army or longer road or buy out all the Victory Point development cards, a quiet player has been building settlements, cities, and using the competition to their advantage. Yes, the VPs from longest road and largest army are a good boost. However, if you let obtaining them consume you, you can lose it all. You don’t have to get Traders and Barbarians to use HarborMaster. Make rule where anyone who get’s 3 points or most points on harbors (ports), add 2 victory points. This adds a nice tweak to the game giving players a 3rd option and strategy to get points. A strategy that’s worked for me more than once was to build roads from each of my two settlements but not connect them. I’d let another player hold onto the “Longest Road” points until the end of the game. Sometimes, they could be so focused on needing just 1 point to win that they forget how quickly that could change if I go up 2 and they go down 2 just by me connecting my roads together. Couple that with a victory point card and a settlement in the last round and I can jump 4 points from 6 to 10 at a point in the game where an opponent counted me out and thought they had it in the bag. Sometimes this is too obvious and you have to be careful of an opponent blocking you. On occasion it works and when it does it’s a*uva finish! When moving the robber, if I’m trying to decide between a couple different people to target, I usually pick the one who had the most recent turn. That way, even if they have a knight card to move it, there are more rolls taking place before they get that opportunity. If I put the robber on a hex affecting the person who takes their turn right after me, it’s likely that they’ll move the robber before even one roll goes by. Everyone that plays this game a lot will tell you that the initial set up is the most important part of the game. What though is the best way to pick? Do you go for the Wheat/Ore gambit, the Brick/Wood proxy, or do you snag a 2:1 port and focus on that one resource? All of the above will not ensure you get resources. The only thing that wins you resources is getting that number rolled. The best way to set up in the initial phase is to then DIVERSIFY YOUR NUMBERS. Try and get one of each chit number and you will guarantee more cards in hand. Having your first two settlements on the same 3 numbers means that you will only pick up cards for about a third of the dice rolls. Even if the other numbers are on resources you don’t need in your strategy you can always trade them up. Trust me, when you have a wide net you will get more resources and have more fun playing.